Looks like the wedding is going to be on the same day as the election. I mean I can understand that he is a decisive world leader and can't do just what everyone else wants him to do, but I would have appreciated a call! Let's all learn how to postal vote! 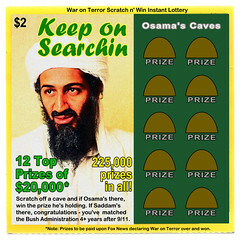 Came across this site selling a War On Terror Boardgame. Hmmm, one for the kids. I guess it balances out the capitalist nature of Monopoly. Do you think Bill Gates used to play Monopoly as a kid? Does anyone in Australia remember playing a game called Polyconomy as a kid? Where there was a government, taxes, and companies, and a share market.